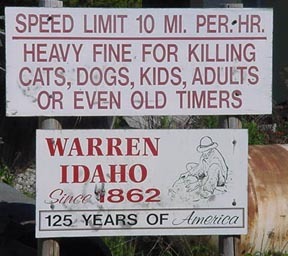 You can reach Warren by taking Warren Wagon Road (across from Lardo's) off Highway 55 in McCall, Idaho. The Payette National Forest has a free Auto Tour tape at their Lake Street office in McCall which describes the scenic 45 mile drive, the history of the area and spots in between. 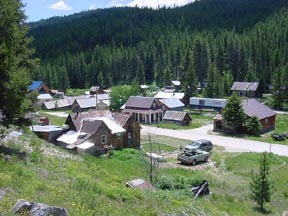 While Warren is frequently listed as a Ghost Town, it has never been without a resident population since James Warren discovered gold on Warren Creek in 1862. It is the 5th oldest town in Idaho and was once the County Seat for Idaho County. The current population is about 12-16 hardy individuals year around and 45-50 people during the summer months; many fewer than its 660 population the summer after gold was discovered and its peak population of approximately 5,000 during the boom times. Warren hosts a Crab Feed (OK, this time we don't feed the crabs - we eat them!) the first Saturday in March, 3/3/2012. Most of the property in Warren is privately owned. Everything is prized by someone. Please do not pick up souvenirs without permission. The Antiquities Act prevents you from taking homes treasures from the past. If your pictures are better than mine, please feel free to send them to me for inclusion on our web page. Make sure you give me your name so I can give you credit for your contribution. With so much to do in the area, I'm sure I've left something out. If you don't see your favorite activity listed or your favorite place to visit, please let me know. Send your ideas, pictures and comments to Becky@secesh.net.